Elustra isn't without its enemies. Deep beneath the surface of the world, Thaggis waits for the proper moment to strike. Unfortunately, a great threat has always loomed over—or, rather, beneath—Elustra and its citizens. 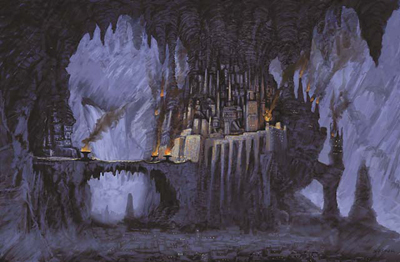 The dark realm of Thaggis is a cavernous underworld that lies just beneath every Elustran’s feet. The beings and creatures that inhabit Thaggis—such as Goblins, Orcs, Trolls, and worse—hate the light of the sun, and seek to conquer the surface world and lay it to waste. The only thing that prevents them from doing so is the fact that they are in constant conflict with one another. Though they have tried to invade the surface realms before, none of them could ever agree on which of their peoples should lead their unholy alliance. They are so filled with chaos and loathing for one another that they can never ally for very long before they are once again at each other’s throats. Their lack of unity acts as a rallying cry for Elustra, for it can never be conquered by Thaggis so long as its people remain true to one another. Though Thaggis is not the focus of every adventure, its existence is well-known, and the Queen’s armies and knights are always on the lookout for trouble arising from the darkness below. Though such incursions are often spotty and isolated, it is prophesied that one day, a great leader shall rise to unite the forces of darkness. No one knows when that day will come to pass, nor do they know the name of the dark lord who will bring the forces of evil beneath his banner.